Floriana’s simmering anger at the performance of referee Philip Farrugia in their 1-1 draw against Ħamrun Spartans will have intensified yesterday after their coach Giovanni Tedesco was handed a four-match touchline ban. Tedesco was reported for remarks he directed towards Farrugia at the end of Monday’s BOV Premier League game at the National Stadium as the Floriana coach and club officials, incensed by the referee’s failure to award them what they claimed were two clear penalties for handball offences, protested vigorously with the match officials. The Malta FA Disciplinary Commissioner took a dim view of Tedesco’s behaviour and duly suspended him for four matches. Floriana, whose president Riccardo Gaucci was very critical of the refereeing sector after Monday’s game, are expected to appeal Tedesco’s four-match ban. 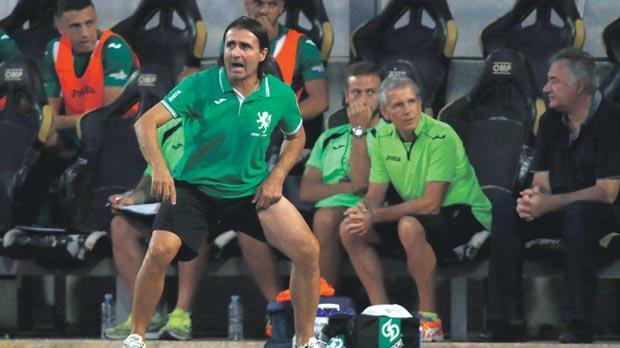 Since Salvatore Caleca, Tedesco’s assistant, was also given a two-match touchline ban, Floriana face the prospect of being without a recognised coach in their dug-out for their next two BOV Premier League games, against Sliema Wanderers on Saturday, and Hibernians on October 15. Valletta winger Uchenna Calistus Umeh has been ruled out of tomorrow’s clash with Birkirkara after being handed a one-match ban following his sending-off in the first half of the 2-0 defeat to Hibernians last Sunday. The Nigerian joins Leandro Aguirre on the sidelines as the Argentine left-back is yet to complete a two-match ban following his dismissal in the 2-0 derby defeat to Floriana last week. League leaders Balzan, the only unbeaten team in the champion-ship, will be without Justin Grioli for their match against St Andrew’s tomorrow. The experienced right-back was given a one-match ban after collecting his fourth booking in the 3-1 victory over Gżira United on Monday. Meanwhile, Sliema Wanderers have strengthened their squad with the signings of Brazilian duo Denni and Tiago Bruno Goncalves. Denni is rejoining the Wanderers whom he helped win the FA Trophy during his first spell with the club in the second half of last season. The 34-year-old forward has also had stints with Tarxien Rainbows, Valletta and Hibernians. Sliema’s decision to hire the services of Tiago, a centre-half, was dictated by the absences of first-choice defenders Stefano Bianciardi and Roger who are both recovering from injuries. Denni and Tiago are expected to be included in the Sliema squad for the Old Firm clash against Floriana on Saturday. Valletta are expected to boost their midfield options with the signing of Valdo Alhinho. The Angola-born midfielder is set for a return to Maltese football after turning out for Sliema Wanderers, Floriana, Msida St Joseph and St Andrew’s between 2010 and 2013. Alhinho, who spent the last two seasons with Portuguese second division club Oriental, has been on Valletta coach Paul Zammit’s radar for several months. The 27-year-old had been hopeful of securing a move to Swiss club Lausanne in the summer but the deal failed to materialise. Plagued by a dearth of midfielders due to the absences of Roderick Briffa, who is sidelined for several months due to a cruciate injury, and Claudio Pani, who has a calf problem, Zammit has been given the go-ahead to bring in Alhinho who was due to report for training with the champions yesterday ahead of tomorrow’s game against Birkirkara.